Crafty Andy: When It rains is so refreshing! When It rains is so refreshing! I am in such a creative mode in my crochet that for relaxation I turn to other crafts, knitting, weaving and spinning. I aim to have a new hat pattern next for July. It is in my opinion a very simple Tapestry Crochet hat, but definitely something that will be fun to make and wear. I have to say that when it comes to the craft of making hats with textures and colors, Tapestry crochet gives me such freedom. I enjoy making hats so much, and my newer hats are really for the whole family. I think that Tapestry Crochet offers such a great advantage to manipulating the stitches, I never thought I could create so many different hats. Sometimes I start the hat the same way I did the previous hat, but on the road of making the new hat, I am thinking on innovation. Tapestry crochet is a bit more about commitment than about skill, yet to make many of my hats you need to know your front and back post stitches. 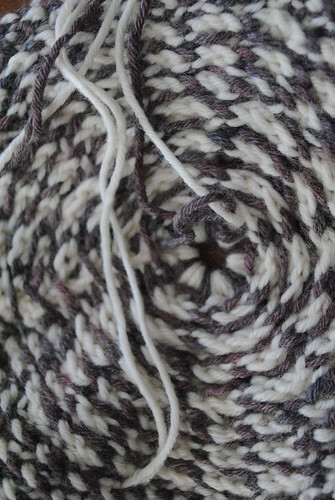 Gauge is really not that important as far as making a hat, yet you should be able to approximate the size of the hat you want by how many stitches per inch you are making following the pattern. Whether yo want to really relax your stitch or tighten the way you close the stitches, it is amazing how much difference you can make by relaxing your tension. At any rate I hope you have a great week and thanks for stopping by!